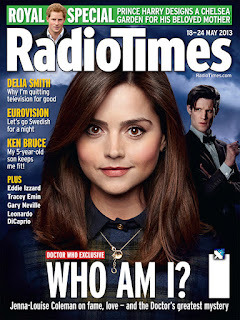 As fans are no doubt aware, Jenna-Louise Coleman stares out enigmatically from this week’s Radio Times above the tagline ‘Who Am I?’ and inside she talks about her life prior to travelling with the Doctor and how she handles the fame it has brought her – seeing an action figure of yourself must be an undeniably odd experience and one Ms Coleman jokingly describes as being not ‘completely normal’. On being recognised by the public she is unfazed, mentioning a boy who said to her, ‘You all right, Soufflé Girl?’, adding that it made her smile. When she was fourteen Ms Coleman persuaded her parents to move her to nearby public school, as the small Victorian secondary she had attended offered nothing in the way of opportunities to develop as an actress. She attributes her cautiousness regarding press attention to this move, saying that it was both the best thing to happen to her but also the worst. Describing herself as ‘quite a nervous person’, particularly when on a one-to-one basis, she says that she’s never been on a date. With age though she says it’s becoming easier to relax in social situations. ‘I’m making myself sound socially inept here and I’m absolutely fine in a group of people but I am quite shy,’ she says. Speaking about this week’s episode, The Name of the Doctor, she gives little away, saying; ‘in the beginning we see a Clara in the '60s, '70s and the '80s, so there are a lot of costume changes, which I love.’ On working with Matt Smith she describes the experience as being one that she loves. ‘His first advice was never Google yourself and, now that I’ve got a three-month break, he said take your time and choose your next role carefully.’ So Ms Coleman is off for a holiday in Croatia once filming is complete, leaving the rest of us waiting till Saturday to find out not only the name of the Doctor, but also the answer to the question: who is Clara? We get to know Jenna-Louise Coleman a little better after the Radio Times interview but the Impossible Girl remains a mystery, for the moment. DOCTOR WHO MAGAZINE #460 OUT NOW! 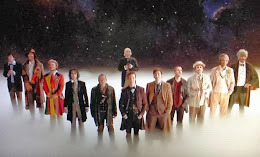 DWM CONFIRMS - NO PAST DOCTORS!